Tonya Garcia’s children have grown into standout track and field athletes, but she’s always pushing them to do more. When she was competing at the University of Texas-Pan American as a student-athlete from 1990-93, she earned major points in five events. She would often begin her day with jumps at 8 a.m., then help close out the competition at 8 p.m. as part of the mile relay. Garcia’s efforts paid off with plenty of points, a trio of program records and an induction to the UTRGV Athletics Hall of Fame at 11 a.m. Saturday in the UTRGV Ballroom. She still holds the program record in the long jump after posting a mark of 20 feet, 1 3/4 inches in 1993. She was also a program record holder in the 400-meter relay and indoor 200 dash, though both marks have since been bested. Garcia continued to compete after college, eventually setting a new personal record of 21 feet in the long jump. 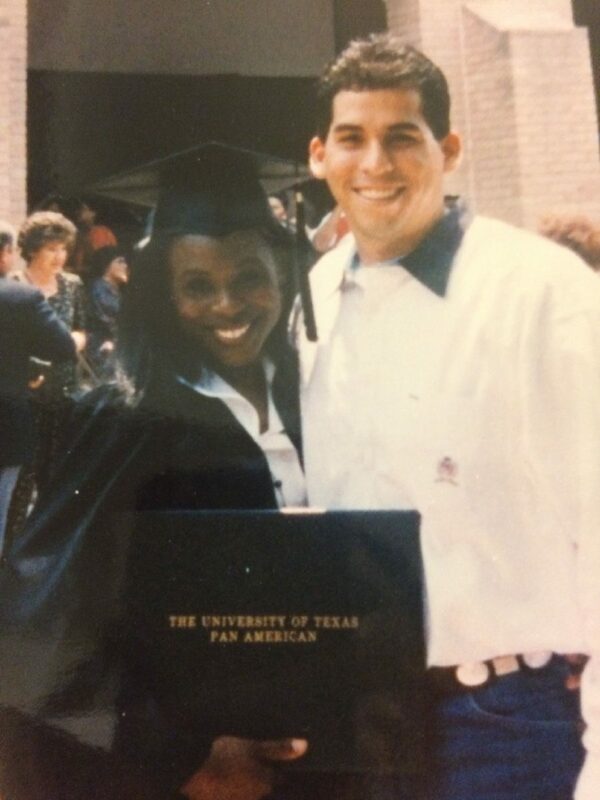 She also regularly earned points in the triple jump and in various relay and sprint events at UTPA. Garcia is still involved in the sport, helping to coach her four children: 16-year-old Soledad, 13-year-old Halle, 11-year-old Gus III and 10-year-old Pilar. Soledad was part of a state-title winning mile relay team, and Halle has been nationally ranked on the AAU circuit in the 55-meter dash, Tonya said. Tonya has also been involved in coaching at the high school level, heading the girls soccer program at Edinburg Vela during the 2016 and 2017 seasons. Tonya said she grew up playing soccer but gave up the sport when her high school in her hometown of Ennis didn’t field a team. Now, all three of her daughters play in the FC Dallas program. She’s also coached high school track in Edinburg, spending one year at Vela and two at Economedes. After graduating UTPA, she originally worked with Border Patrol as a federal agent before opting for a safer path. “We decided we wanted to have a family and started having kids, so I decided to do something a little less dangerous and that would involve me being at home more with my family,” Tonya said. Tonya and the family moved to Denton last year, and she’s currently a teacher at a pair of high schools in Denton ISD — Braswell and Ryan. Having lived in Edinburg longer than anywhere else, Tonya said she’d like to someday move back to the area, perhaps as soon as next year. Tonya is part of a UTRGV Athletics Hall of Fame class that also includes the 1975 baseball team, Ricky Brockway (baseball, 1974-75), Mire Chatman (men’s basketball, 2000-02), Alex Gravel (women’s basketball, 1998-03) and Leah (Viloria) Hampton (women’s tennis, 1987-91). Additionally, program supporters Dan and Terry Martinez are being inducted to the Hall of Honor.